My Thoughts: Mothers and Other Liars is one of those books that leave you saying 'Wow' after you finish that last page. I was hooked from the very beginning of this book. The character development was unbelievable, the entire cast of characters were so well written, each one was crafted with care by the author. Lark was delightful character, she was an old soul but still had the funny characteristics that a nine year old child would have. Lark will remain an unforgettable character to me. The writing style of this book is unique, at the beginning I found it a little difficult to follow, a little distracting but after the first few chapters I started to get used to it and then I started to enjoy the flow of it. Mothers and Other Liars will take on you an emotional ride, packed with twists and turns. At moments it is heart-wrenching and others heart-warming. Amy Bourret is being compared to author Jodi Picoult, I can see the similarities in the writing style and the unique story lines but each author has something different to bring to the table. 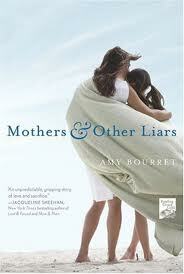 Mothers and Other Liars provides a book full of hope, love, trust and forgiveness. I would definitely recommend this book. Sounds like The Deep End of the Ocean from the other woman's perspective. While I wasn't a fan of it, I think this sounds intriguing. Thanks for the review! I've added this to my "to-read" list now. Thanks for the review. Sounds like a great book!